Sorry for the late post >_< I used a little bit different camera settings with these photos than normal. I'm trying to slowly, but surely convert over to my new camera. I just haven't got there yet or have time to sit down and fiddle with settings. :P Alright enough blabbing from me because you need to see these beautiful polishes from Smitten Polish! 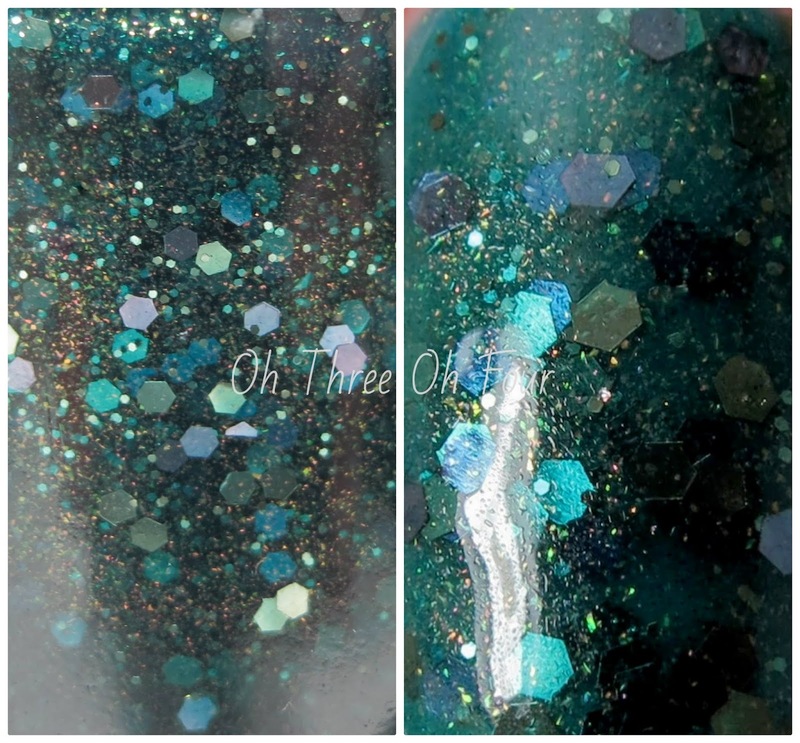 Copper Canyon has a green-tealish jelly base with copper shimmer and medium and smaller sized copper and rose color hex glitter. All nails are 3 coats with a top coat of Seche Vite. Nerds Redux is a reformulation of an older shade Smitten Polish used to make called Nerds! It has fuchsia hex glitter and light blue holo hex glitter in a purple creme base. I used 3 coats with a top coat of Gelous and Seche Vite. Pink Goes Good With Green has a various sizes of pink, green and purple glitter in a milky green base. All nails are 3 coats with a top coat of Sally Hansen Insta-Dri. When I put this on, I'm pretty sure my face looked like the Surprised Chin meme "Pink really does go good with green!" *mind blown* The colored base does a perfect job of not overpowering the other glitters and well, I think the first part of this paragraph sums up my thoughts on it. ;) Formula was another winner, with no problems to report! Sprites of Spring is a deep teal "crelly" with pink/purple shimmer. I used 3 coats with a top coat of Seche Vite. Smitten Polish can be found on etsy here. Except for Pink Goes Good With Green, all of these colors are currently in stock! Make sure to like Smitten Polish on Facebook here and sign up for her newsletter here, to stay current on new colors being released and stock updates.